In variegated shades of red, a huge 300 feet of sandstone rock point at a 45-degree angle to the intense blue Colorado sky. This gigantic rock upcrop leaves an impression on you all by itself. But there is much more. This magnificent red rock joins another nearby huge shipshaped monolith of red rock rising sharply upward. Both anchor row upon row of bench-type rock seats leading down to a stage far below. The view becomes even more awesome as you look out over the panoramic backdrop of metro Denver. Now you realize this is something so spectacular that it was once ranked as one of the Seven Wonders of the World. Taller than Niagara Falls, this is the Red Rocks open-air Amphitheatre just west of Denver where the mountains and the music of famous past performers rise up from the plains. The early Native Americans who lived on the plains knew this red rock place was magical and conducted many tribal ceremonies in this natural amphitheatre. There were concerts held on a wooden stage from 1906-1910 testing the waters for what would follow. A noted opera singer stood on this makeshift stage at the bottom of the chasm and sang. When her performance was over, she emphatically claimed this was the best acoustical sound that she had ever experienced. 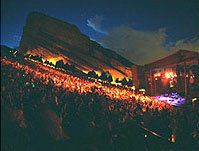 After the City of Denver purchased the land in 1927 and designated it as a park, the Denver architect, Burnham Hoyt, began designing the amphitheatre to blend in with the beauty of the natural surroundings. Workers were generated through the federal Civilian Conservation Corp and the Work Projects Administration who also provided materials. These government programs gave unemployed young men a chance to work on designated projects for pay. This whole area was once an ancient sea floor. Over 250 years of geological history hold telltale bits and pieces with real Jurassic dinosaur skeletons frozen in time along with impressions of tropical plants pressed into the soft sandstone rock. Nearby you can visit actual sites of these ancient footprints. 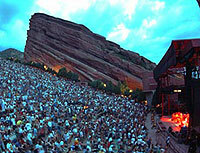 Red Rocks is a venue for up and coming performers as well as long established names. The Hall of Fame in the visitor center honors such performers as the Beatles, Willy Nelson, Sting, the Grateful Dead, John Tesh, and Bruce Springstein. A continuous movie tells the Red Rocks Amphitheatre story accompanied by music and quips of famous artists who have played there. 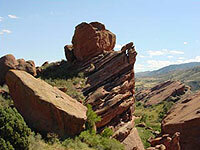 Take a picnic and hike the many trails in this 816-acre Red Rocks Park. Hours: Open daily from 5am to 11pm. On event days, park closes to visitors at 5pm. follow the signs to the entrances.